Honestly, I wasn't sure if Show Me a Story was going to fall into the "gift book" category for me. You know the type - the kind you flip through and then set to the side. (If you're my friend, please don't ever gift me with a gift book. They aren't really real books, you know.) I was pleasantly surprised by this title though. No, I was more than "pleasantly surprised." I was delightfully enthralled. As you can clearly see, I had no choice but to immediately fall in love with this book and everything else that Emily K. Neuburger would have to say. I began to flip pages and drink in her thoughts and ideas about developing the art of storytelling in not only my children, but myself! See, I'm not a crafty person. See supra. I only like playing chase and pretending something about Angry Birds for ever so long and then I get kind of, well, bored. (True confessions.) I'm not a mother who likes to really play with her kids. But I absolutely love reading stories together. (Are you so shocked?) The idea of finding ways to tell each other stories in a playful sort of manner just rocks my world and opens up all sorts of possibilities for positive and fun interactions with my kids. I am HYPED about utilizing this book and the ideas inside of it in our home. Before child #3 arrived on the scene, I was pretty good about making up stories with my oldest son in particular. He loved "making stories" with his little animals. But I got busy and we let that habit fall by the wayside. I've missed it and wondered how we can get that time back and rebuild some of the storytelling skills which have gotten lost in the busyness of life. I've also been thinking a lot about the differences between stories with blatant morals (e.g., "Polly is Afraid of the Dark") verses a more polished and well-told story involving darkness (e.g., Prince Caspian, The Dark Island). Both stories can address the same issue, but a beautifully crafted tale will stick in our minds and hearts long after the last page has been turned and the book has been closed. Instead of always harping on what is right or wrong (e.g., "You need to be obedient...") it would be far more pleasant to teach my children lessons through fun, interactive play. I've been horrible at this of late and Show Me a Story has given me a shot in the arm of creativity and hope for the way I can better enjoy my time with my children. 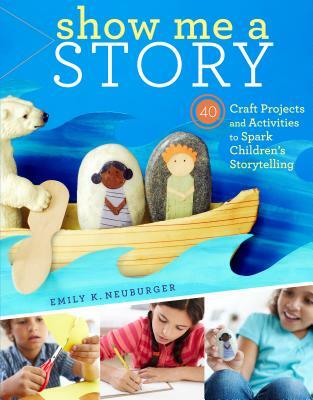 As the book's subtitle suggests, there are 40 craft projects and activities to "spark children's storytelling." (And, let's face it, it can also help spark adult story telling as well. A great side benefit, no!?) For each activity, Neuburger suggests the youngest age which any given project might be suited for, the time frame required to make the project, and the number of people that the particular activity is suited for. Of course, she also includes materials necessary and tips for how to complete certain of her ideas. Because I'm not a craft person, I won't follow her ideas specifically but I will be putting some of these ideas into practice in a more generic fashion. I'm really excited to start a "Story Chest" filled with a variety of items (some of which I'll make based on ideas gleaned from this book) and other household "stuff." Mostly I'm just really excited because I feel like Neuburger gave me a way to play with my children (and my children do love to play with their parents!) in a way where we can all enjoy the pleasure of each other's company and be silly and have fun. I think this book is awesome. I truly do. Very interesting, especially because I just spotted a book at the library with a very similar title/premise. That sounds fun. I'll have to look for it. We have tried doing a "story-telling club" around here, which everybody loves except for the part about WAITING TURNS. Sounds great. I am so very un-crafty...I always need a little help coming up with projects. And anything that relates to storytelling automatically gets extra points from me. Love the ideas and glad you are encouraged. I'm not crafty either, but we do a lot of storytelling around here. The favorite reoccurring characters are "Fred the Hop Toad", "Leisel the Lamb" and "The Blue Putt Putt". :) My two oldest are great storytellers to their younger siblings--who knows, they may one day publish some of these stories! Thank you so much for such a thoughtful, engaging review of my book. I am so pleased to hear that you feel so enthusiastic about it, and I wish you many hours of storytelling fun. I'm so much more crafty than story telling-y, despite my love for story. This sounds great!! I can see why this would appeal to you! Looks like a great resource. No gift books for Carrie, check. This one sounds so cute! Loved reading this post.